Matt Pinnell, left, and Kevin Stitt talk to reporters at a watch party in Tulsa on Aug. 28, 2018. 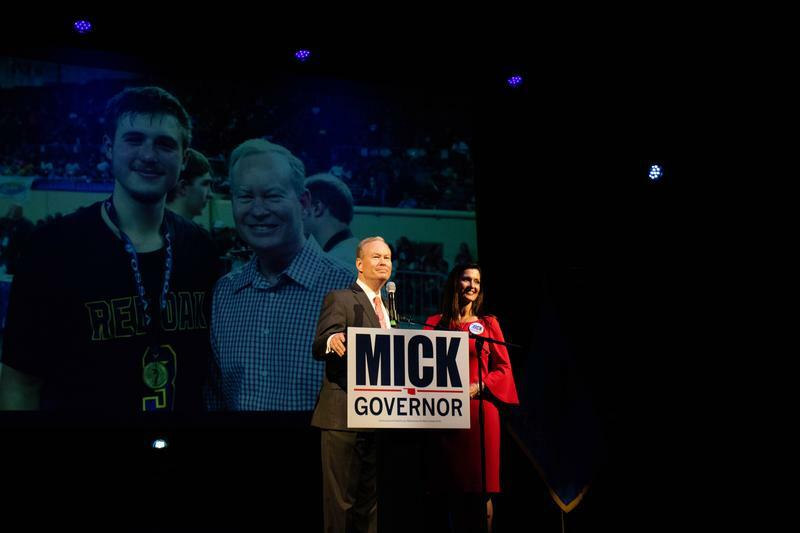 Former Mayor Mick Cornett stands with his wife Terry and thanks supporters after conceding the Republican gubernatorial runoff at his watch party in Oklahoma City. A political outsider will be the Republican party's nominee for governor. Kevin Stitt, a Tulsa businessman, defeated former Oklahoma City mayor Mick Cornett in Tuesday's Republican primary runoff. Stitt defeated Cornett 55 to 45 percent. Stitt will face Democrat Drew Edmondson and Libertarian Chris Powell in November's general election. Powell defeated Rex Lawhorn in the Libertarian runoff. At Stitt's watch party, he called out to voters who supported Cornett in the runoff. "And to all of those who supported him, you know, I want to work tirelessly to earn their support because they share the passion that we all do, that we want Oklahoma to be a great state," Stitt said. Kevin Stitt speaks to his supporters at his watch party after winning the GOP runoff for governor. All vote tallies are unofficial. While Stitt cruised to a 10 point margin of victory, some other statewide races were far closer. Incumbent state Attorney General Mike Hunter narrowly defeated Republican challenger Gentner Drummond by 269 votes. "I promised my supporters that I wouldn't make them pay for a landslide," Hunter joked at his watch party. Despite the slim margin of victory, Hunter said he is confident in the vote count and declared victory. Gentner indicated he would not concede the race until all provisional ballots had been counted. Matt Pinnell topped Dana Murphy to win the nomination for Lieutenant Governor. He will face off against Democrat Anastasia Pittman in the general election. Pinnell said he and his wife had dinner with the Stitts before the campaigns started, and while governor and lieutenant governor are not a joint ticket in Oklahoma, the two GOP nominees are on the same page. "The lieutenant has got to be working with the governor, carrying out their vision. You’re president of the state senate, constitutionally, the lieutenant governor is. So, the way that I see it is, he’s going to have a vision, he’s going to have a plan, and we’re going to help try to carry it out in the legislative level," Pinnell said. In other statewide Republican races, Cindy Byrd defeated Charlie Prater by 951 votes for the State Auditor and Inspector nomination. She will face Libertarian John Yeutter in the general election. No Democrat filed for the race. Incumbent Superintendent for Public Education Joy Hofmeister fended off challenger Linda Murphy. Hofmeister will run against Democrat John Cox in the general election. For Labor Commissioner, Leslie Osborn defeated Cathy Costello. In November, she will run against Democrat Fred Dorrell. Bob Anthony beat Brian Bingman for the Corporation Commission nomination. Anthony's Democratic challenger will be Ashley Nicole McCray, who secured her party's nomination over Blake Cummings. McCray's race was the only statewide primary runoff for Democrats. Of the 10 Republican incumbents who faced challengers in yesterday’s primary runoff election, six lost. And if there’s a theme among those who lost, it’s that they all voted against this year’s $450 million dollar tax package to fund teacher pay raises. In the closest race among incumbents, Rep. Bobby Cleveland of Slaughterville lost to Oklahoma City Public School administrator Sherrie Conley for the House District 20 seat. Conley beat Cleveland by 66 votes. The other five who lost are Travis Dunlap of Bartlesville, George Faught of Muskogee, Jeff Coody of Grandfield, Mike Ritze of Broken Arrow, and Tess Teague of Choctaw. Five Republican House members, and one Republican Senator, lost in the primary election in June. Coody had represented House District 63 in southwestern Oklahoma since 2014, but he was unseated by insurance agent and farmer Trey Caldwell by an unofficial total of 408 votes out of 2,520 cast. Coody was the legislator who likened last spring’s efforts by Oklahoma teachers to improve education funding to extortion. His comments were recorded and later released publicly by a high school class visiting him at the state Capitol. Those comments made Coody a target of pro-education groups and made education a key issue in the race. Caldwell advances to the general election in November to face Democrat Joan Gabelmann, an assistant principal for Lawton Public Schools. The field is set for the only open Congressional seat in Oklahoma. Tulsa restaurant owner Kevin Hern won the Republican nomination for House District 1. Hern defeated Tim Harris. Hern will face Democratic nominee Tim Gilpin, who defeated Amanda Douglas in the runoff. U.S. House District 1 is the seat that was previously held by Jim Bridenstine, who is now NASA administrator. In U.S. House District 2, Tahlequah mayor Jason Nichols defeated Clay Padgett for the Democratic nomination. Nichols will face incumbent Republican Congressman Markwayne Mullin. Mary Brannon won the Democratic nomination for U.S. House District 4. She will challenge incumbent Republican Rep. Tom Cole. Kendra Horn secured the Democratic nomination for U.S. House District 5 over Tom Guild. Horn will face incumbent Republican Rep. Steve Russell in November. 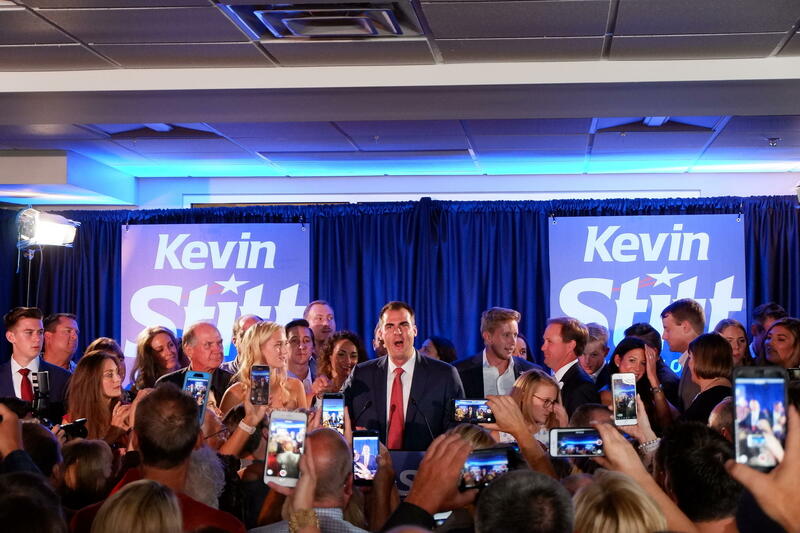 Tulsa businessman Kevin Stitt has defeated former Oklahoma City mayor Mick Cornett to secure the Republican nomination for Oklahoma governor. Stitt will face Democrat Drew Edmondson in the November general election. In other statewide Republican runoffs, Matt Pinnell defeated Dana Murphy for the Lt. Governor nomination, and incument Superintendent of Public Instruction Joy Hofmeister overcame primary challenger Linda Murphy. Some races remain too close to call. Mike Hunter, the incumbent state Attorney General, trails his challenger in the Republican primary, Gentner Drummond, by less than one percentage point with just 263 precincts left uncounted. Charlie Prater holds a thin lead over Cindy Byrd for the Republican nomination for State Auditor and Inspector. Ashley Nicole McCray defeated Blake Cummings to earn the Democratic nomination for Corporation Commission. Absentee and early voting results show a close race for the Republican gubernatorial nomination between former Oklahoma City mayor Mick Cornett and Tulsa businessman Kevin Stitt, as well as for several other statewide Republican races. With 205 precincts reporting, Stitt leads Cornett by about five percentage points. Incumbent Superintendent for Public Education Joy Hofmeister holds a 13 point lead over her primary challenger, Linda Murphy. Republican incumbent state Attorney General Mike Hunter faces a tough race in the runoff. He currently leads challenger Gentner Drummond by about two points. Hunter addressed reporters at his watch party in Oklahoma City. Oklahomans are heading to the polls today for primary runoffs to choose nominees for several statewide offices, as well as many legislative seats. 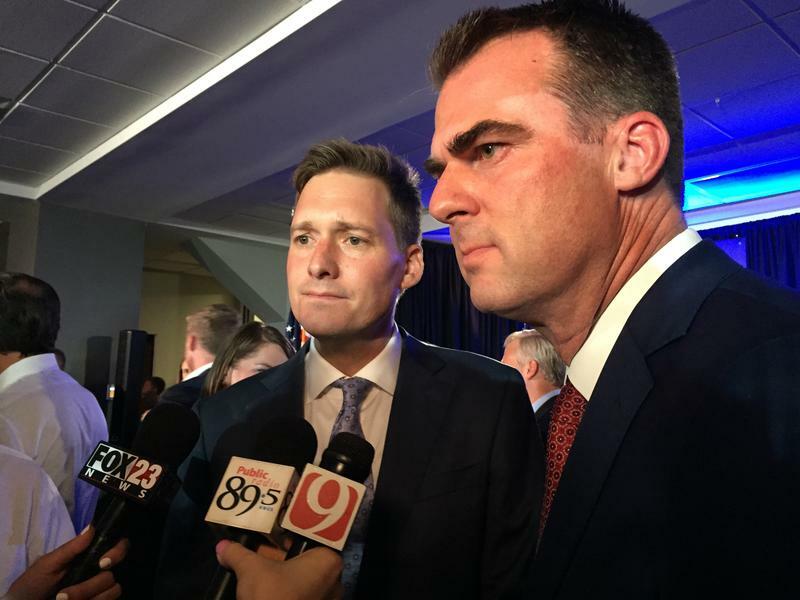 The headlining race is the Republican gubernatorial nomination between former Oklahoma City mayor Mick Cornett and Tulsa businessman Kevin Stitt. Other statewide Republican races that will be decided today include Lieutenant Governor, State Auditor and Inspector, Attorney General, Superintendent of Public Instruction, Commissioner of Labor and Corporation Commissioner. Democrats will pick their candidate for Corporation Commissioner, and Libertarians will choose their candidate for Governor. Several incumbent lawmakers are also on the runoff ballot. Jeanette Mendez, a political scientist at Oklahoma State University, said incumbents tend to fare poorly in runoffs. “The voters at some level have started to lose faith. And so it's not surprising. Not only did they get forced into a runoff but usually that's a signal that something's not going well,” Mendez said. Mendez said turnout for runoffs is typically lower than for primaries because there are fewer candidates on the ballot. Additionally, she said voter fatigue can hamper turnout. For the last two gubernatorial runoffs, no party had more than 10 runoffs. Election Board Secretary Paul Ziriax said this year there are 35 runoffs for the Republicans, 12 runoffs for Democrats and 1 for Libertarians. He also said there was an increase in voter turnout in June compared to the general election in 2014, which he said is unusual. He said the increase could also lead to an increase in voter turnout for the runoff elections. “For the most part a runoff election is less than the primary election. In this runoff election all three recognized political parties have a runoff election that’s statewide, so hopefully that will drive some turnout,” Ziriax said. Ziriax said the increase in voter participation this election season could be due to State Question 788 and more open seats in statewide offices. State agencies in charge of protecting elections spent months beefing up security, especially cyber security. Authorities are on especially high alert after reports of election-tampering across the country during the 2016 elections. Ziriax said ballots will be accurately counted and recorded for the primary runoff. He said the biggest threat to Oklahoma’s voting process comes from disinformation campaigns designed to erode trust in elections. “We are working day and night … to make sure that elections are protected and we need voters to go to the polls and vote,” Ziriax said. Election officials said Oklahoma’s voting system has never been hacked. But Oklahoma is one of 21 states reportedly scanned by Russian hackers.